Digi-Schlock: COUNT DRACULA (Severin Film Blu-Ray) – Schlockmania! Severin has been on a roll with Jesus Franco films this year, releasing impressive blu-rays of Vampyros Lesbos and She Killed In Ecstasy and even bringing Devil Hunter into the world of high-def cinema. 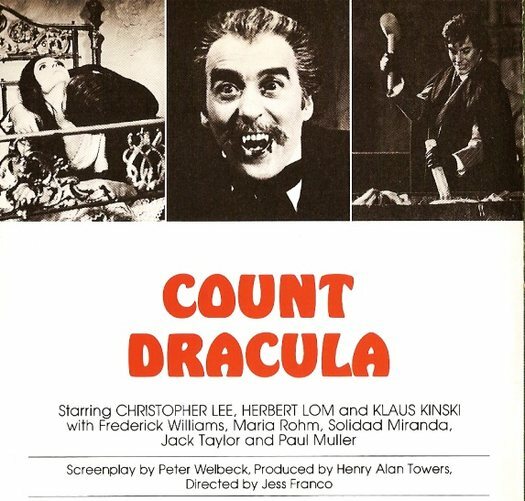 The final month of 2015 has brought one more Franco biggie from the Severin crew in the form of Count Dracula, the last of Franco’s films with Harry Alan Towers. Like the Vampyros and She Killed discs, this is a deluxe presentation stacked with plenty of frills. The main feature is presented in a 1.33:1 ratio that represents the director’s preferred framing and is uncut, with the infamous “baby scene” restored. Though the film was often matted during its theatrical run, the framing used here looks accurate. Colors are pretty strong and the source material looks good while detail is strongest in the closeups (check out Mondo Digital’s assessment for more technical specifics). The mono English dub is presented in LPCM form here and sounds pretty good for a hastily-made vintage dub – fans will be happy to know that Christopher Lee and Herbert Lom did their own dubbing here. Severin Films has gone all-in on the extras here. The package begins in a suitably deluxe fashion with an HD presentation of Cuadecuc Vampir, an experimental quasi-documentary shot on the set of Count Dracula by Pere Portabella. 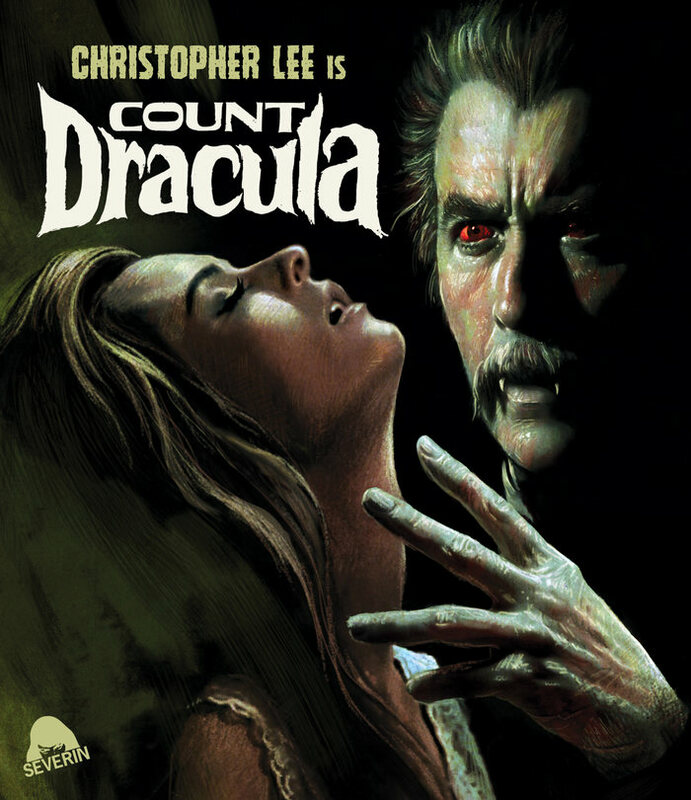 It mixes alternative angles shot concurrently with the main unit footage of Count Dracula with behind-the-scenes footage. Most of it is presented with sparse sound effects or music but stick around for a fun bit at the end where Lee is captured talking about Dracula. The visual quality is pretty good, particularly when you consider the use of extreme high-contrast photography in spots. Next up is an audio commentary for Count Dracula featuring star Maria Rohm and moderator David Del Valle. The two establish a nice rapport as Rohm discusses her history with Franco, her thoughts on his work and eccentric ways plus some interesting thoughts about how she considered her film work a way of fighting sexual repression. Del Valle keeps her going with questions and offers critical thoughts as well as historical info on Dracula and its many adaptations. A 26-minute interview with Franco is carried over from the film’s Dark Sky DVD release. It’s a typically opinionated and irreverent chat with Uncle Jess in which he offers an overview of the filming, his opinion of Towers and his thoughts on the cast, including an amusing assessment of Klaus Kinski. Towers also pops up briefly in this piece. A pair of cast interviews follow. Jack Taylor appears in a 10-minute sitdown where he waxes nostalgic about the adventure of working with Franco but takes exception to the sexual explicitness of his later work. He also talks about his work with Roman Polanski on The Ninth Gate. Fred Williams pops up for a 26-minute chat where he talks about the intimate, tight-knit quality of a Franco film crew, offers a pretty scathing assessment of Towers as well as frank thoughts and a few funny anecdotes about his castmates. He’s not afraid to criticize Franco’s eccentric, sometimes abusive ways and recounts a 2001 reunion with the director that is briefly shown via a few video clips. Director Christophe Gans offers a nearly 8 minute appreciation of the film, covering a lot of ground in a brief time as he gets into the particulars of Franco’s style and offers an interesting theory about why Franco and Kinski got along so well. Lee fans will be pleased by the appearance of an 84-minute audio segment of the actor reading from Dracula. He gives it the brio that horror fans will expect. The package is rounded out by four alternative titles sequences and a trailer. The titles sequences show the German, French, Italian and Spanish versions of the opening credits. The trailer was created for the German market and is cut together in a flashy, pop-gothic way, complete with playfully creepy narration, and it makes the film look like a Hammer production! In short, Franco fans are likely to be happy with Severin’s work here, particularly with the generous array of bonus features. 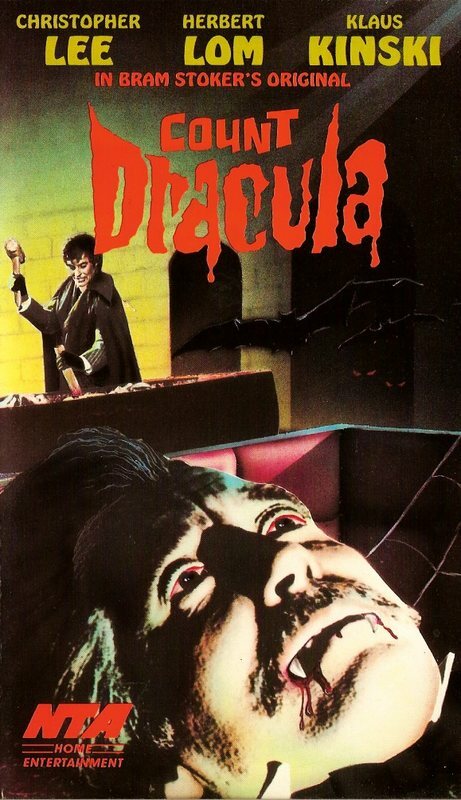 To read Schlockmania’s film review of Count Dracula, click here.